I can't believe my little girl is 2 years old. 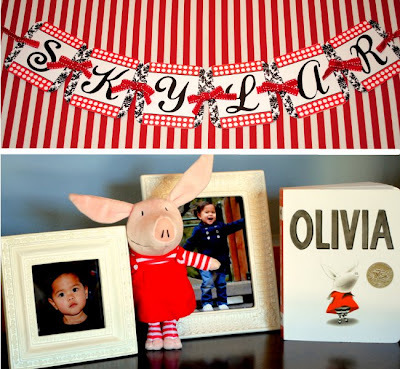 Yes, Skylar turned 2 and we threw her an Olivia the Pig inspired celebration. Why Olivia the Pig you might ask? I don't remember when exactly this started, but some time after she turned one, Skylar would demand to watch Olivia on Nick Jr. while having her nighttime bottle. She could barely say a few words, but she would yell "OLEEVA!! OLEEVA!!" every time I would sit on the couch holding her and her bottle. And the whole family (Brody included) fell in love with the character. So thus I started to plan her 2nd birthday party. Overall, the party was everything I hoped it would be. Skylar was surrounded by family who love her and our birthday girl had a fabulous time! I am extremely grateful to my husband who helped me with numerous projects and who listened to hundreds of ideas that would randomly pop up in my head. Thank you Chris for being a supportive and loving husband. To stay on a low budget, I baked all of the treats except for the actual birthday cake that we purchased from Walmart. I also created all of the party printables (dessert labels, cupcake toppers, banners, favor tags, and "2" cake topper) - Sweet Metel Moments shop is now on Etsy! The birthday girl is wearing a cardigan and Olivia t-shirt from Target and polka dot skirt from Babies R'Us. I made the custom hairbows just for her! I am so grateful to the hard-working women of the following sites who inspire me in so many ways! Overall Party/Dessert Table Inspiration: TomKat Studio, Hostess with the Mostess, Amy Atlas Events, HowDoesShe, and Pizzazzerie. Future posts and links for DIY projects and recipes coming soon so stay tuned!! 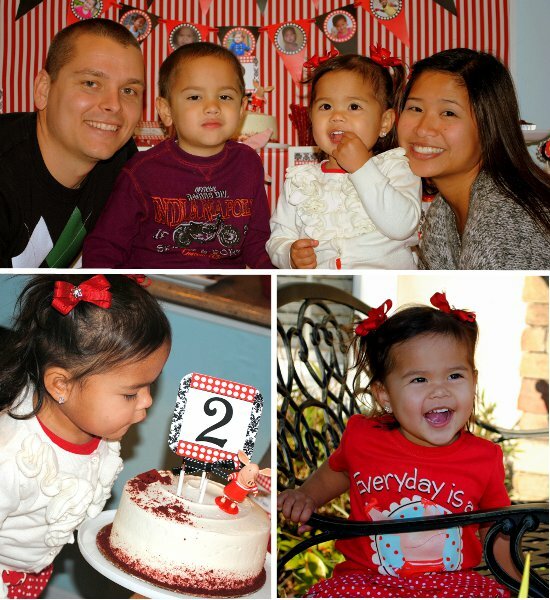 Thank you to our family who attended Skylar's celebration and has showered her with love for the past 2 years! I know that Skylar will have a great support system as she grows up. Love you guys! such a cute party and birthday girl!!! Wow!! One of the most beautiful and unique Olivia parties I have seen yet!! You are so creative!! The only thing I can never figure out is how do all you DIY party girls create those backdrops?? my daughter calls her "OLIA"
Wow, you are really talented, the entire thing was just fantastic... did you ever think of doing parties for a living? YOU ARE AWESOME!!! Thank you for all the wonderful ideas, birthday parties are my favorite to plan and decorate for!!! Keep up the awesomeness!!! How did make the banner?! Very creative and beautiful.